Although the award is based on regular-season performance, the Volunteers (31-5) tied a school record with a 31st win Sunday in their 83-77 overtime victory over Iowa in the South Region, where they are seeded second. Barnes has Tennessee playing in its seventh all-time Sweet 16 later this week in Louisville, Ky., where they face Purdue on Thursday. This is only the second 30-win season in Tennessee’s history. Barnes’ guidance helped keep Tennessee ranked among the top 10 in both national polls throughout the season that included sitting at No. 1 in the polls for four weeks at the end of the record win streak. Led by Oscar Robertson Trophy finalist and first-team All-American Grant Williams, Tennessee finished second in the Southeastern Conference with a 15-3 record and a 29-5 finish to the regular season. 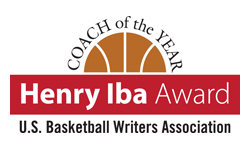 He was chosen from a list of finalists that also included three of the last four winners in Tony Bennett of Virginia (2018, ’15, also won at Washington State in ’07) and Mark Few (2017, Gonzaga), plus another former winner, Houston’s Kelvin Sampson (’95 at Oklahoma), as well as Chris Beard (Texas Tech), Matt Painter (Purdue), and Mike Young (Wofford). Tennessee’s record 19-game win streak saw spanned from late November into mid-February, marking the longest win streak of Barnes’ coaching career, and while defeating three top-five opponents along the way the Vols led the SEC and were 20th nationally in scoring offense (81.7 ppg). Their 49.6 shooting percentage also led the SEC and was seventh nationally. Barnes, who earlier this month was named the USBWA’s District IV Coach of the Year for a second consecutive season, will be honored at the USBWA College Basketball Awards Dinner at the Missouri Athletic Club in St. Louis on Mon., April 15. Public tickets for the dinner are on sale at collegebasketballawards.eventbrite.com. Tickets are $150 per person and include dinner, drinks and parking in the MAC garage. Sponsorship opportunities are available by contacting Jim Wilson at the MAC at 314-539-4488. This is the 24th time Barnes has led a team into the NCAA Tournament, the most among active SEC coaches. After Sunday’s win, Barnes is 88-49 (.642) in four seasons at Tennessee and 692-363 (.656) in 32 seasons overall.